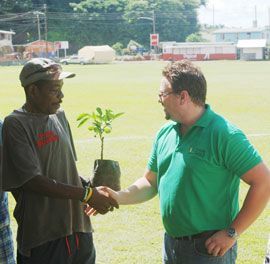 Some 200 fruit trees ranging from mangoes, oranges, tangerines and golden apples, among others, were donated to residents within the community through the areaâs representative Burgin. Residents turned out to witness the handing over of the plants and to receive the plants for their private residences. Minster Burgin stated: âI am grateful as the parliamentary representative to be able to do something for the community to enhance the environment … I am grateful to Karib Cable for their contribution to develop the Calliaqua areaâ. Karib Cable is the only provider of Triple Play service in St. Vincent and the Grenadines; Cable TV, High Speed Broadband Internet and Fixed Line. With Karib Cable there are a variety of options and no one service is required in order to get the other.